I get woken up yesterday to the phone ringing, it's Joey calling to say a wrecker just slammed into his brand new truck. When I sent him off to work I told him he shouldn't even bother because it was storming in the mountains so they probably wouldn't get through anyway. I was right. They made it past the gate only to be turned around farther up when they shut the mountain down completely, after a six truck pile up happened first. As Joey's coworker turned his truck around he slid into the embankment, then as Joey tried to tow him out, he got pulled down too. Not a big deal, they made it out, and as they're parked on the side kicking mud off their trucks a wrecker had just turned around and was making his way back down the hill. That's when his rear end started sliding and slid past Joey, slamming his rear end into Joey's front end. It all happened in slow motion, and all he could do was bear down and watch it happen. I immediately thought that meant he was out of work until it's fixed, but luckily it's still capable. Instead of going to another job, though, he comes home so he can regroup, and figure out why his welder was sputtering. Turns out it works fine at our elevation, about 5500. We bribe the kids with new video games and we all head to Grand Junction for welding supplies, and yarn. :) While we're down there Joey's friend calls, needing to sell his spare welder ASAP, and we just happen to need a spare welder. We drive ALL THE WAY up to Glenwood Springs to meet him at the repair shop where he's getting his truck fixed, and pay the mechanic for him. Look close enough and you'll see the Colorado River, too. It's dark now and we're heading home when half way there we run into an extremely windy snow storm that's ripping it's way up the I-70 corridor. We can barely see, the drunk bumps on the side of the road are acting as our guide. We know as long as we hit them we're still on the road. We punched through the storm right before our exit to find the single lane road up the hill to our RV Park is not moving. We go eat, and it's still not moving. There was a wreck, and evidently it was a bad one. We go the back way up and finally make it home to find out there were NUMEROUS accidents happening behind us on the I-70. I assumed I knew how to make the hat so I started it, and then got all the way down to my last knit before I read the instructions on how to cap it off. Turns out I did it backwards, I had the top where the brim should be, and no brim where the top should be. Oh well, I ended up unschooling myself through the rest of the hat and we love how it turned out. And that is my final post on knitting, we will now return to my usual blog of half assed travel stories and bus living. 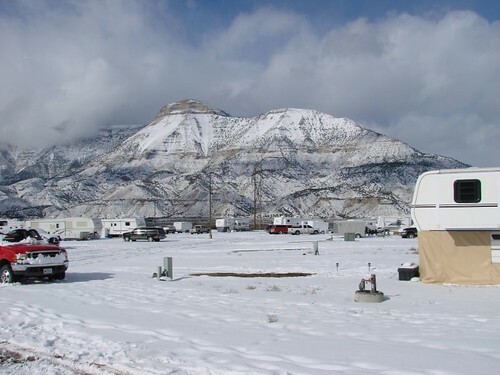 To answer Stacie, we are currently on the western slope of the Rockies in Colorado, where the temps have been averaging around thirty for the highs, and hovering in the teens at night. The next four days we're expecting four to six inches of snow daily, with temps getting down to two. Just for shits and giggles I'll even take you on a mini tour of our RV park as it's been lately, and ever since we got back here, end of December. They say last year the snow lasted about a week. It's been a coooold winter. Yet, we've been able to keep toasty inside. Directly in front of the bus, looking towards the northeast. Standing in the doorway of the bus, looking North. 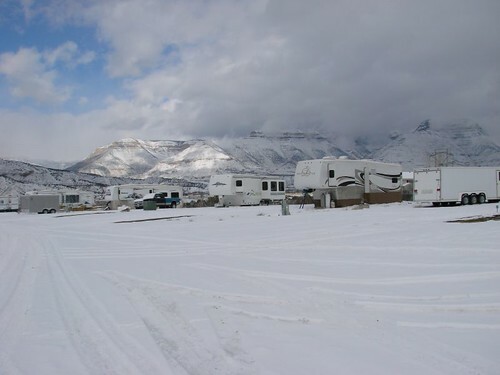 These mountains not only serve as a nice backdrop for my viewing pleasure, but they also house all the oil drilling rigs that my husband currently works on to bring in money, also for my pleasure. I gave him a camera to take some pictures up there, where he's often welding in the middle of blizzards. When I get some from him I'll post them along with a little more information on his current job, which he feels compares alot to unschooling. I mentioned I recently became addicted to knitting. It's not really knitting, unless you consider using a round loom, knitting. I feel like I'm too young to be knitting. Only Grama's knit. And hippies. Then I remembered when I actually learned to knit and crochet, I was ten years old. We were living in Germany and my parents had drug us to German public school. German school was nothing like American schools that I had been used to. My school was in an old fire station, so there were only two classes, mine and another fifth grade class.....and we did not mingle. Germans start and end school with the kids, and in some cases the same teacher. The kids also cussed, even cursing the teacher, Herr Goebel. For that year I had Anatomy, Algebra, Religion (which I sat out), German (spelling, reading & such), Writing, and French. We had school on Saturdays, but we were let out everyday by one, and earlier if the temperature reached eighty degrees. My teacher didn't take it easy on me being the only American, and I actually did pretty well. I struggled with French because I had to translate the French to German, then to English, and frankly, I wasn't into it. A couple days a week we'd go to the main campus where it looked more like a University, and there is where I had crochet class, knitting class, and puzzle making, along with indoor swim and Gym. It was a fun school, but probably mostly because I knew this was basically a year off, it didn't really matter what or how I did, when I got back to the States they wouldn't acknowledge any of it. My Mom still has the sock monkey I crocheted, and the fish puzzle is around somewhere. 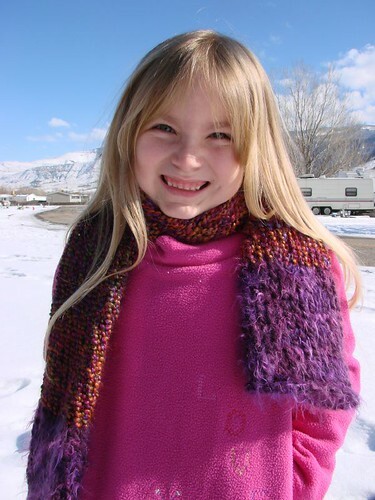 I can't remember what I knitted, but I'm sure my Mom still has that, too. See how easy it is to live on the road and get rid of stuff, just have a packrat for a mom. I was hooked. 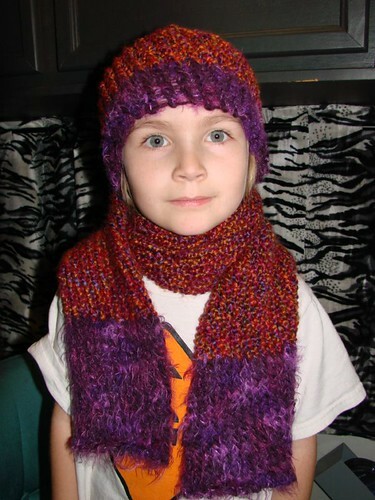 I could hardly stand to be with myself the next day because I needed a bigger loom to make her a matching hat. As much as I hate leaving the warmth and comfort of my bus, Jewel and I forced ourselves to go to Wal-Mart in search of more looms and yarn. I've already knitted the hat, and now I'm trying to figure out how to finish it off. The selection of yarn was depressing so we'll have to make a trip to Grand Junction for some more funky yarn. I'm glad I found something more productive to do than just watch TV, but I still give myself a hard time about not getting outside. Jewel and I attempted a walk yesterday, but the breeze, even as slight as it was, was just too much for my comfort. I did shovel snow for an hour, though. We've never shoveled and the snow outside our door keeps getting more and more packed down, which is now a five inch slab of ice, so I'm working on getting it safer. Today is a bright sunny day, so I may just look for a park to take the kids too, since the five day forecast is snow, snow, and more snow. Hmmmm, I know Grand Junction has nice parks. Update on Satellite: After five days of tests HughesNet has determined that I have fast speeds and a good connection. I've determined: For $99 a month, it's PATHETIC. I went with HughesNet for our Internet. I went with them because eighty percent of the time we were out of cell phone range and all I needed for the satellite was a clear view of the sky. Plus thousands of people use their satellites so they must be decent, right? Wrong. I am still having issues getting it to work, another reason why I've been silent on the blog. They sent the installer out three days ago and he replaced all the cable, tried a new modem, and replaced the transmitter on the dish SEVEN times. Seven. He even switched me to a different satellite, making that my third one now. It still takes about five minutes to load a webpage and forget about getting to any secured sites. I was on the phone with them over an hour the day before and again this morning. They've now got me doing periodic speed tests and then after three days they should have a better diagnosis as to why we can't seem to get it to work properly. If it were up to me I'd have them take their equipment back and say Good-Riddens, but they won't let me out of my contract....wihout paying a $700 termination fee first. I'm at a loss right now, basically makes us never even want to turn on the computers anymore. The customer service people are so nice, it's impossible for me to yell at them, but I am so tired of paying for something and getting nothing. Three days, I'm giving them three more days. In the meantime, I've been knitting. Just proves I can get addicted to anything. During our hiberation we had to venture out for hunting and gathering, otherwise known as Wal-Mart. Since we were in Rifle, CO we decided to check out the ice caves near Rifle Falls State Park. After getting there I realized I didn't have a coat, and in twenty degree temps it was way too cold to explore ice caves. 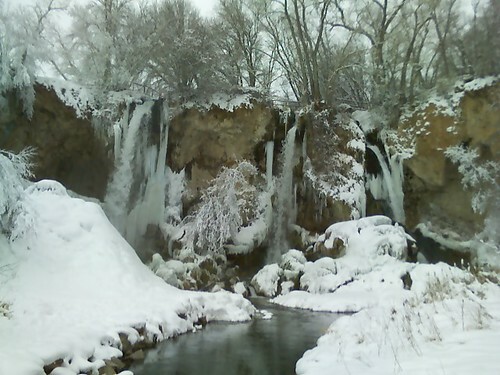 I stole Joey's sweatshirt and the kids and I, along with camera phone, ran out to the waterfalls (the boys actually skated in their sliders) to see how they look in the winter. 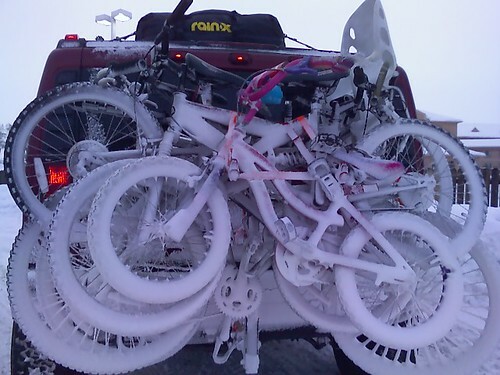 They were almost as frozen as me. We have come as close to hibernating as humans can. I can't say I don't like it, either. Since I last blogged, all five passengers became ill. Right after I bragged up how *healthy we all are, so don't worry about us catching what you've got*. Jonas came down with it first, then we all quickly followed. It was a respratory flu, or maybe just a chest cold, I don't know, but we're all better now. Of course Joey was convinced there was hidden mold in the bus and we were all slowly dying. We took another week to fully recover, or some could call it an excuse to watch every reality show currently being aired, and took the time to consider our options. What are we doing? Where are we going? Why are we here in -10 degree temperatures when Kimberly is in shorts in Florida? Where is our next paycheck coming from? We even came up with some answers. We're here because we really like it, and it's a bonus that there just so happens to be a major gas boom going on in these hills. There's enough work here to last fifteen years, and we've got a nice RV spot that we don't want to lose. The problem is I wanna travel, really we all do, I'm just the only one that whines about it. So we're talking about getting a fifth wheel or travel trailer, with a bedroom for the kids, so we can then park the bus and use it as our travel camper. The RV spot we have is big enough to have an actual yard, complete with deck, trampoline and portable spa(wishful thinking). I didn't enjoy traveling by car and sleeping in hotel rooms and guest rooms, so having the bus readily available to just hop in and go will make it much easier, and more likely. And, Joey will be able to stretch a little farther in something with slides. Win. Win. For me this is kinda settling down, even though it's in an RV Park, we would be parking with the intent of it lasting a few years. Last time we tried to settle down by buying a house in small town America, with no decent work in sight. We did our traveling to, during, and from the job. What a novel concept to actually *settle down* near work. What a brilliant idea. We're going to California end of February to watch our nephew take off for Iraq, then hopefully on to an unschooling conference in Arizona. Oh, and Joey still wants a boat by May. He went back to work today. When we left Fort Worth, it was about forty degrees and sunny, so I wasn't prepared for the white road trip home. I get a little delusional sometimes and believe the sun will always be shining. I also believe West = Warm so coming into more and more snow the farther west we went, wasn't in my thinking. The best white stuff we came across though was somewhere between Fort Worth and The Panhandle (that's a lot of somewhere, but that just goes to show how bad my memory is, and why I feel compelled to preserve what I can actually remember)....It was cotton! Lots and lots of cotton. During my years in Mesa, AZ I saw small cotton fields, but it was nothing compared to the thousands of acres we drove through. At times I couldn't tell the difference between the cotton balls blowing across the road to rest in the tumbleweeds and the snow hiding out in the shade. Joey packed my car and my camera, so many times I was tempted to stop right in the middle of the highway just to pick some up...but when I heard "Mom, you're slowing us down!" I trudged on. Jonas was surprised to hear that cotton grows from a plant, so that led to a discussion of other wearable plants. Which led to man made fibers, and everyone wanting to know what they were wearing, and how it was made. Ummmm.....I know hemp and cotton grow in the dirt....How far did you say you got your battle droid, Jake? The first night we stayed in a hotel in New Mexico, which must have been built in the Fifties. We entered our room from the outside, but had another door on the other side that entered into a HUGE indoor room, complete with pool tables, trees, picnic tables, sunroofs, and a pool. It'd be a great place for a gathering of friends or families, but odd to be so close to so much entertainment, like a big backyard, but inside. We stayed with friends the next night in their cabin in the woods. Just a little cabin with four patios, two level garage, heated floors, five bathrooms, thirty ton rock fireplace with waterfall, and our private set of suites downstairs by the hot tub. Did I mention the million dollar views out the two story high windows? I couldn't talk them into goldfish for the moat around the fireplace, though. Originally we were going to go back home the same way we went down, over Vail Summit via I-70, but all about new drives, we opted for scenic byways cutting right through the middle of the State. That was such a good decision, too. Not just because of it's beauty, but they ended up closing Vail Pass later on in the day. I found my camera, only to find it's dead, but not to fear...I broke out the camera phone! 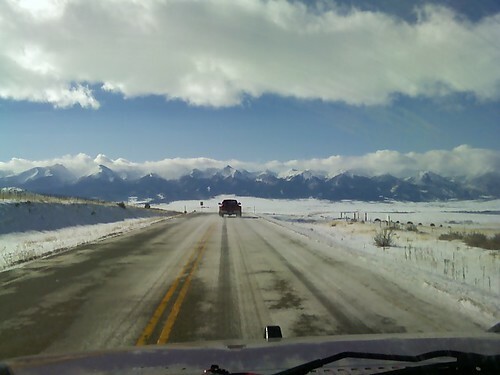 Heading towards the Sangre de Cristo mountain range, was a sight like no other. 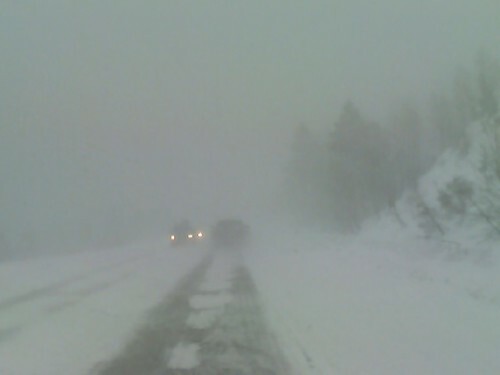 Monarch Pass ~ Now this was a sight that was hard to see. It was really frightening at times, but as long as I could see Joey's taillights I didn't panic...much.